Tucker and Dale manages to find an angle in the cabin movie horror genre as yet untapped. Eli Craig lampoons these films by putting his audience into the point of view of the hillbilly psychopath characters creating a great comedy of errors pitting a couple of lovable but hapless hillbillies against a group of pretentious college students. It makes for a riotous comic horror affair. 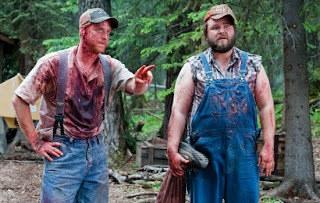 Tucker and Dale (Tyler Labine and Alan Tudyk) are a couple of backwater hillbillies lifted from ‘Deliverance’, ‘Texas Chainsaw Massacre’, and ‘The Hills Have Eyes’, except they’re actually really conscientious, genuine and respectabale citizens. But to a bunch of spoiled college kids on a camping trip who’ve seen all these movies they look like psychopaths. They first meet at a local gas station where Eli Craig cleverly intercuts the two conversations of the two sets of characters. The college kids can only read crazed maniac from their actions and words, but from Tucker and Dale’s point of view, they’re just trying to make friends. Tyler Labine plays the trivia smart/common sense dumb Tucker with great sincerity. Early on Tucker tries to ask the blonde hottie Allison (Katrina Bowden) out on a date. Despite his good intentions, he's off as more than awkward, to the Allison, a pyschotic inbred killer. Tucker and Dale and the college kids (which becomes Tucker’s generalized term for them) convene again at an decrepit cabin in the woods. What looks like an ‘Evil Dead’ cabin to the kids is the ‘summer home’ purchased by Tucker and Dale, who have become proud homeowners. The comedy errors escalates into action when by accident the kids start accidentally killing themselves in horrific ways, which of course make Tucker and Dale look like murders. At one point, while Dale is chopping some wood one of the kids runs after him and accidentally jumps into the chipper. A fun love story emerges between Tucker and Allison, a beauty and the beast romance, which caps of this ingenious genre twister. 'Tucker and Dale' is fun midnight madness entertainment. Like Shaun of the Dead, Craig has an intimate love for the genre, and his knowledge of the tropes of cabin in the woods storytelling makes for a movie as genuine and as hionest. And Craig has heaps of comic gore satisfying the blood quotient of the genre. But it's Tyler Labine and Alan Tudyk who riff and roll like a great Laurel and Hardy comedic duo that makes this even more fun then the twisty concept.